Need a quick and easy fairly healthy dinner? 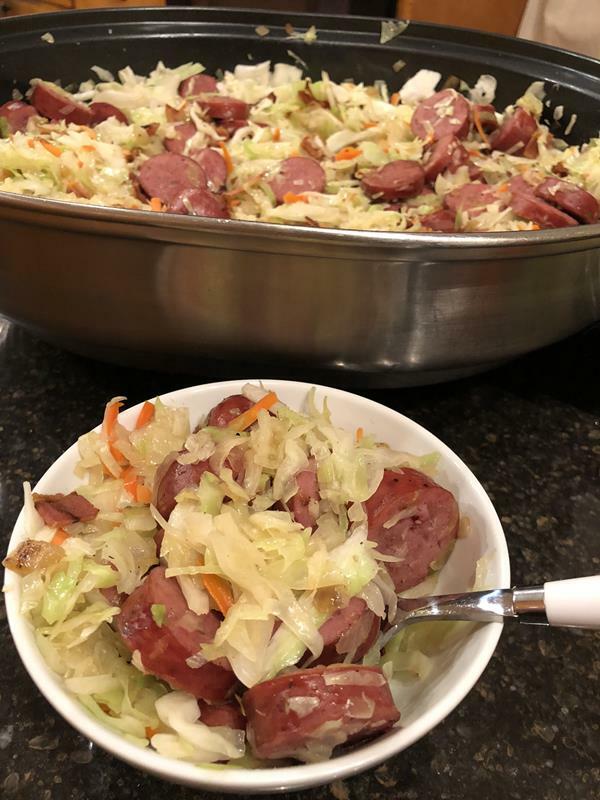 Fried Cabbage and Kielbasa is perfect for an easy, fairly healthy, one pot meal. 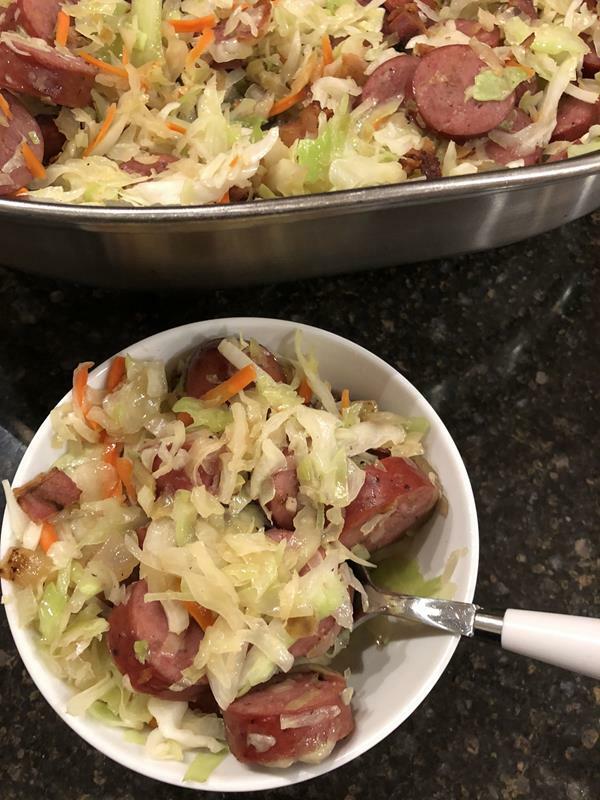 Fried cabbage and kielbasa is a meal even cabbage haters will love. I am not a huge fan of cabbage, but I love this easy dinner. Fried cabbage tends to be an southern food. Or maybe more of an old fashioned food. I am not really sure, but it was not something that I remember eating much of growing up. When I moved to Oklahoma, which is far closer to the south than where I grew up, I realized that fried cabbage was a staple in many homes. It is an easy and inexpensive side dish to serve and I have learned to really enjoy it. 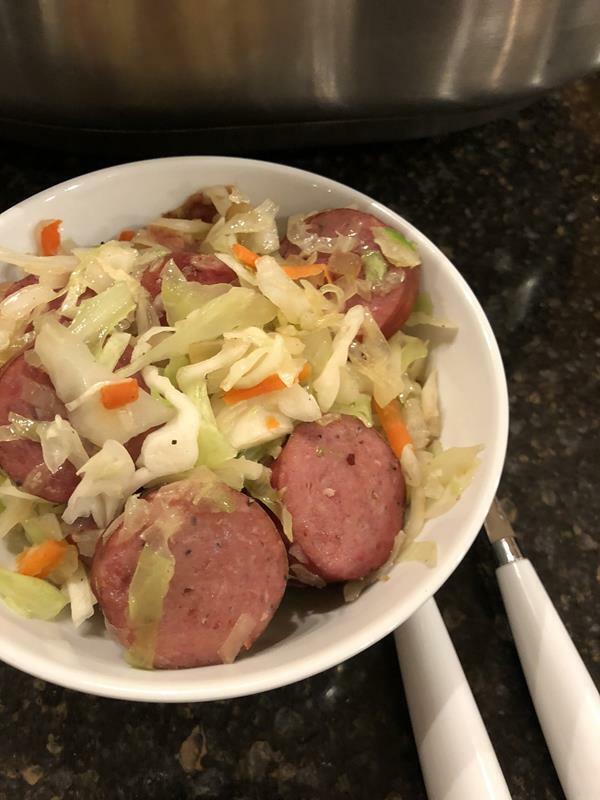 One of my favorite things about fried cabbage is that it can easily become a one pot meal by adding some meat to it. By adding meat is has protein and vegetables all in one easy one pot recipe. Using only one pot makes cooking and clean up easy! It also contains basic ingredients. If you don’t have kielbasa you can easily use a different type of sausage. For the cabbage I use a bag of coleslaw mix. Yes, you can buy cabbage and shred it, but I like easy and the bags of coleslaw mix make it easy. Plus, the coleslaw mix usually contains two kinds of cabbage and carrots, so it adds some variety. I use my electric skillet for this because it is the perfect size, but you can easily use a big skillet or wok type of pan. This is one of those recipes that you can easily half or double. I like to double it because my husband and daughter love this leftover the next day for lunch. Need more One Pot Dinners? In a large pan, skillet, or wok cook bacon and onion until bacon is cooked and onion is tender. Drain off all but about 3 tablespoons of fat. Depending on how my grease there is, you may not need to drain the fat off. Add kielbasa and cook until sausage is lightly browned and heated through. Add cabbage and fry for several minutes, stirring often. Cook until cabbage reaches desired tenderness. If you like it slightly crisp cook for a couple of minutes. For a more cooked cabbage cooked for about 5 minutes.